Home > Kids Deals > Webkinz Animals Sale: $2.46 Each Shipped! 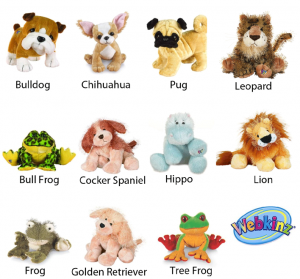 Webkinz Animals Sale: $2.46 Each Shipped! The awesome Webkinz deal is back! Get 15 Webkinz animals for $37 shipped. This makes it $2.46 an animal. We did this before Christmas and they are full size animals, perfect for upcoming birthday parties or just as a fun treat every now and then. Each animal also comes with a unique code to give free access to the Webkinz site. I’ll warn you, they only have 1000 sets of these, and they will go very fast. If you want it, buy it.